She’s discussed her abusive ten-year relationship with ex husband Stephen Belafonte in her new book, Brutally Honest. 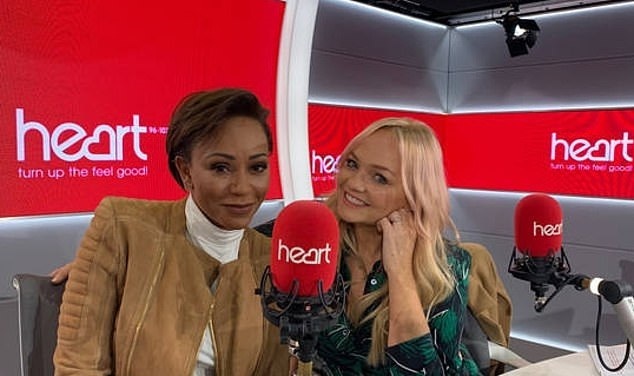 And Mel B, 43, told her fellow Spice Girl Emma Bunton she did it because she doesn’t want her three daughters to end up in similar situations to her. Mel is mother to Phoenix, 19, from her marriage to dancer Jimmy Gulzar, Angel, 11, from her romance with Eddie Murphy. And Madison, six, is from her marriage to Belafonte. She added: ‘If you are in a relationship where you are being humiliated or made to feel less than you are, it is a crime. She told Emma that since 2016, ‘coercion’ has been deemed a crime with a maximum five year prison sentence. It’s when a victim experiences the type of behaviour that stops short of serious physical violence, but amounts to extreme psychological and emotional abuse at the hands of a partner. Mel laughed: ‘I was married for 10 years and most of my work is in America and Australia so you know aside from my lovely Spice Girls, I am quite an independent money earner and I love earning money. ‘And that’s also a form of control, also for your partner because they put you out to work so you can’t think straight.